Distribution The original wild form is known from China, Hong Kong, and possibly northern Vietnam. Sexual Dimorphism Females tend to grow slightly larger than the males. Mature females have a rounded belly and can often be seen carrying eggs. Water Parameters Soft, slightly acidic water is recommended. pH: 6.0-7.0, dH: up to 8 degrees. Compatibility Community of small peaceful fish only. The beautiful Black Crystal Bee Shrimp is one of the wild forms of Caridina cantonensis that is now captive bred en-masse for the aquarium trade. These shrimp are highly social creatures that are best maintained in large colonies. They are suitable for mature aquariums containing communities of small, peaceful fish only, as larger tankmates will regard them as a snack. Black Crystal Bee Shrimp are excellent algae eaters and will browse on many different algae types. Highly recommended for planted aquaria, they will not damage the plants, instead they will feed on any dead leaves - and large groups will also be beneficial in keeping the leaves of slower-growing species free from nuisance algae. Tall plants seem to be particularly favoured, and these shrimp can often be seen climbing and 'hanging around' in plant cover near to the water's surface. Like most species of shrimp, an elevated nitrate level will not be tolerated - ensure high standards of water quality are maintained at all times, ideally with small partial water changes performed a few times per week. Filtration should be efficient but gentle; always try to aim the output of the filter towards the surface of the water to ensure that there is a sufficient level of oxygenation (something that can be all too easily overlooked in gently filtered shrimp aquaria). Black Crystal Bee Shrimps will moult regularly whilst growing, and the sudden appearance of perfectly formed shrimp casings on the floor of the aquarium can cause alarm to fishkeepers who have not seen this before. The shrimps can sometimes be seen feeding on the casings - this is actually very nutritious for them, so do not rush to siphon them from the substrate. Once the shrimp has moulted, it will remain hidden for a time until the new shell hardens and it has a bit more protection. Be aware that these shrimp do not tend to fare well in water that is over 26 deg C (79 deg F), and for greatest long term health, hard, alkaline conditions are best avoided. A grading system has evolved over time to separate Black Crystal Bee Shrimps with different intensities of colour and size/number of white patches - the higher grades commanding quite astonishing price tags from some breeders. Acclimatise these shrimps very carefully and slowly, either by drip acclimatisation or using a Maidenhead Aquatics Fintro. Black Crystal Bee Shrimps are considered somewhat delicate and so they are not recommended for beginners. Be extremely careful if using CO2 injection on planted aquaria containing these shrimps, as they will not cope with swings in pH. Although you will always hear of cases where Black Crystal Bee Shrimps have been kept in water with a higher pH or temperature, lifespan, overall health and breeding will be severely diminished under such conditions. May also be seen on sale as Black and White Crystal Shrimp. Will browse on algae and biofilm. Supplement the diet with algae wafers, sinking pellets, crushed flake foods, small frozen foods such as daphnia, baby brineshrimp, mini-bloodworm etc., and also offer some vegetable matter such as blanched spinach or courgette. It can be beneficial to add some dried Indian almond leaves (Terminalia catappa) to the aquarium as biofilm will form on these as they slowly rot, and this provides a great source of food for the shrimps, whilst helping to maintain a low pH in the aquarium. 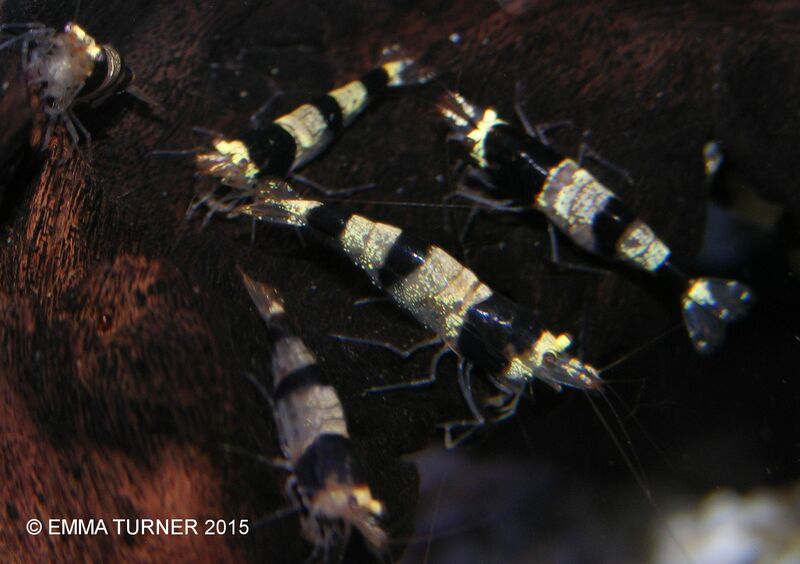 Black Crystal Bee Shrimps often breed freely in the home aquarium given optimal conditions. Best results occur when the water is slightly soft and acidic, and when temperature is maintained between 21-23 deg C (70-73 deg F). Females may still carry eggs at the higher end of the preferred temperature range, but smaller numbers of young are produced compared to shrimps living in cooler waters. Colours also tend to be more vibrant at lower temperatures. The eggs are held underneath the female until hatching takes place (approx. 1 month), and will be visible within the abdomen. Unlike some species, the young do not go through a larval stage and, are instead, born as miniature replicas of the adult shrimp. On hatching, the offspring will be coloured black and white just like their parents, however, actual grading cannot be performed until they develop further with age, when the quality of features will be easier to determine. Many aquarists like to cover the intakes of power filters with fine sponges to prevent the tiny youngsters from being drawn in.